I grew up with this crochet hat (toque) on my head most winters (and it usually had one of those big pom-pom balls dangling at the top). My mother made them for us when we were kids and now crochets them for donation to needy families in her community. Since our weather recently turned cold and rainy, I’m now digging out my yarn stash to begin crocheting. This particular yarn went on clearance last fall around the holidays, so I stocked up. When winter sets in I crochet hats for the homeless. 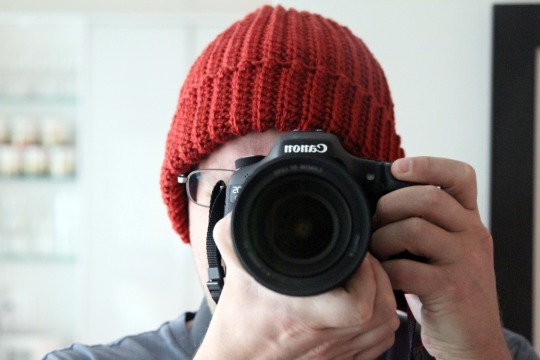 The crochet hat pattern is simple and perfect for a beginner. You’ll need to know how to chain and make a single crochet stitch. The ribbed effect comes from crocheting each row in the back loop of each crochet stitch. There’s a video at the end of this post demonstrating how to crochet in the back loop of a stitch. Also, the hat will be wider at the bottom and gently taper toward the top as you’ll see outlined in the instructions below. 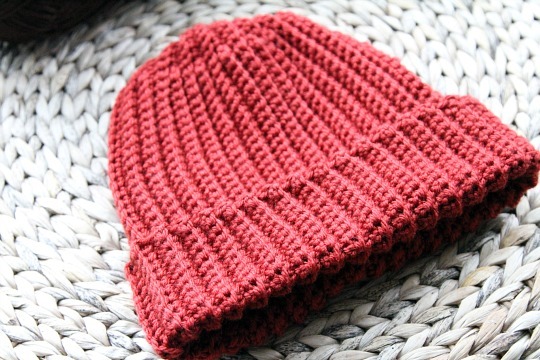 The result is a warm hat that is dense due to the single crochet, yet stretchy and comfortable to wear. Row 3: SC in the back loop of each chain until the end of the row. Chain 1, turn. Row 4: SC in the back loop of each chain to the end of the row (including each of the five chains that were previously skipped. Chain 1, turn. Row 5: SC in the back loop of each chain until the end of the row. Chain 1, turn. 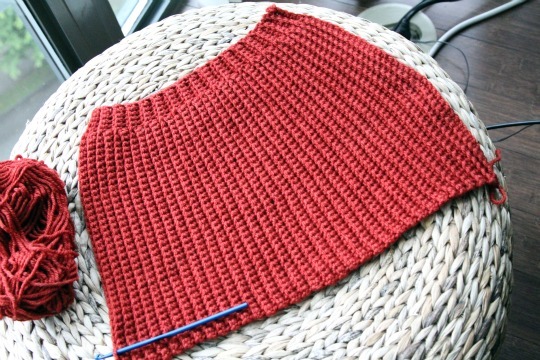 Repeat rows 2 – 5 until desired length (about 17-20″ for an adult hat) is attained. For instructions on how to crochet in the back loop only, see this helpful crochet video from Art of Crochet by Teresa. I’m often asked about the crochet hooks that I use. I don’t use anything fancy and prefer using Boye aluminum crochet hooks, which is what my mom and great-grandmother always used. The hooks are easy to grip and I like the way yarn glides easily over the smooth surface of the hook.